It’s not your everyday, run of the mill design problem. But it is an everyday reality – cows produce significant amounts of the greenhouse gas (GHG), methane, and concentrated animal feeding operations (CAFOs) are therefore point sources of GHG pollution. There are arguments for ending the CAFO practice, but these controversial land uses appear to be with us for the foreseeable future anyway. Can the impacts be mitigated? Can agroforestry techniques be used to mitigate the emissions, and, if you plant a lot of trees, do you still have enough open land to maintain farm functionality? These are the questions asked by the ESF graduate student, Au Ta, in his capstone project, supervised by Dayton Reuter and me. His study produced some very interesting results. Graduate students in landscape architecture programs sometimes produce studies that are worthy of peer-reviewed publication, but these projects often remain hidden in their respective departments. As a discipline, we need to move toward the expectation that this work will be published, either in traditional print media or through online journals. Our colleagues in other disciplines would not squander these resources! Like many LA graduate theses and capstones, Au’s project was not designed from the outset to be a carefully controlled study, but instead evolved over time into something interesting, thought-provoking, and not necessarily easy to publish in science journals because of the degree of intuitive design involved. But the project is well-crafted and reaches some surprising conclusions. Click continue reading to read the abstract and get a link to the entire paper. In response to global climate change, strategies are being sought to manage greenhouse gas (GHG) emissions. In this study, hypothetical landscape designs were developed for a commercial dairy farm to explore the possible implications of implementing mitigation strategies at a local scale. Focusing on the use of vegetative buffers to sequester carbon, alternative designs were created to achieve mitigation targets of 20%, 35% and 50% through carbon offsets and sequestration. The landscape designs demonstrated that GHG emissions from dairy cattle on the Central New York farm could be mitigated by up to 50% of existing conditions using approximately 20% of the area managed by the farm. 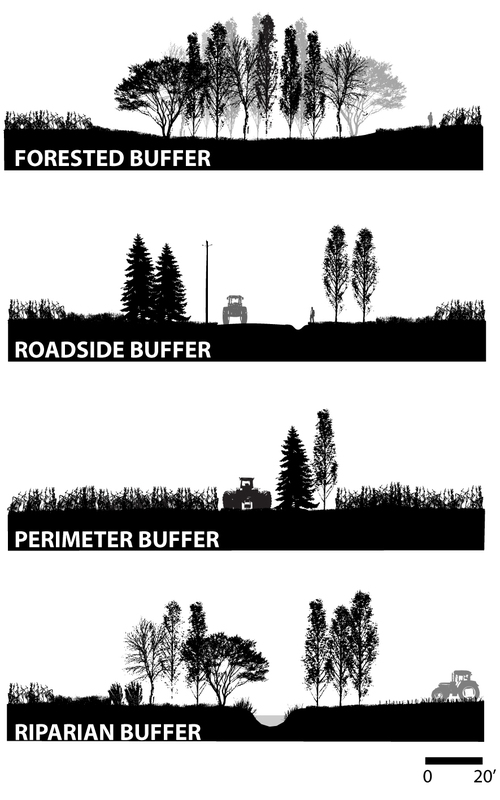 An assessment of the designs indicated that higher percentages of GHG reduction were achieved through buffer designs that emphasized sequestration efficiencies over species diversity, resulting in landscapes dominated by Populus spp. Further study incorporating additional GHG sources and mitigation options are desired to develop a whole farm GHG plan, as well as to understand the potential of using the agricultural landscape to mitigate emissions on a regional scale.